If you are looking for high quality body butters and shower gels, then you should visit The Body Shop at your local mall. In addition to shower gels and body butters, they also sell a wide variety of cosmetics, perfumes, and more. The Body Shop uses natural ingredients in all of their products. Also, their products were not tested on animals and they use recycled materials for their packaging. As if all of that isn't enough, The Body Shop simply sells great smelling products. In my opinion, Satsuma is the scent that puts The Body Shop on the map. It is easily their most recognizable scent. A Satsuma is a type of mandarin orange. 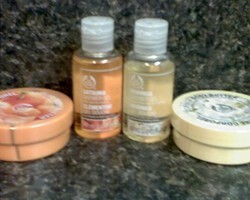 Satsuma shower gels, lotions, butter butters, and soaps have an extremely fresh scent. If you enjoy citrus fragrances, then Satsuma is for you. If you used to enjoy using the Mango Mandarin scented products at Bath & Body Works, yet you've been unable to find it in the stores anymore, you should try Satsuma from The Body Shop. It is not the same scent, but it is similar. Satsuma is actually stronger and has a more natural smell to it. If possible, drop by The Body Shop and take a whiff. It is a fan favorite at the store. If you would rather wear a floral scent than a citrus scent, Moringa is definitely The Body Shop product for you. Moringa is a type of tree, also known as the Drumstick Tree. Little tiny flowers bloom from the tree and, if you enjoy the scent from those flowers, you will certainly enjoy the scent of the Moringa body butter and shower gel. Once again, since some people are more familiar with Bath & Body Works products, I would compare this fragrance to the Sheer Freesia scent Bath & Body Works once carried. This is a different flower and not exactly alike, but both scents are pretty strong and very floral. If you would like to smell as if you just walked out of a flower garden, Moringa is a good choice for you. If you are feeling a little tropical, you might just want to try the Coconut scented products at The Body Shop. If you enjoy the smell of coconut, this particular body butter smells just like the real thing. You might believe someone just cracked open a coconut beside you when you take the lid off the body butter. This is definitely not a product for someone looking for a light scent. The Coconut scent at The Body Shop is intended for major coconut fans. Out of all The Body Shop scents, I would say the Almond is the lightest. If you are looking for a nice light body butter or shower gel scent, Almond is going to be your best choice. I would dare say it is even has a slight vanilla fragrance to it. However, it is light enough that a man could certainly use this product, just like a woman. In general, I feel most of The Body Shop's scents are great for women, but unless it is specifically made for a man, most scents would not work for both men and women. In my opinion, Almond is the exception to that rule. An intensive, creamy all-over body lotion. Contains crushed papaya to refresh and extra moisturizing papaya seed oil to quench combination skin. Also, The Body Shop frequently offers sale items to all customers. While you are there, you can fill out the paperwork to become a part of the rewards program. Even though there is a small charge for the card, you can earn bonus points, save 10% every time you shop, and receive a birthday gift. The card more than pays for itself in no time. So what are you waiting for? It is time to check out The Body Shop and try one of their body butters. I don't think they have great marketing in the US either. I guess they figure the products sell themselves. Came back to read this. I wish we had better incentives to go and shop at The Body Shop here in Romania. I love their products but I feel they need better marketing. There's another company with lesser products (I feel) that does a great job of attracting customers. I'm a Body Shop fan, too! There are smells there for all seasons. I like their spiced pumpkin in the winter, and their light mango, for instance, for the summer. They should be having even more sales this month, so I hope some of the Wizzleys (is that what we are, or do we go by some other name? :) will get to discover Body Shop. They also have great shampoos, etc., etc. Thanks for stopping by, Angel. Yes, these are great body butters, too. I love Bath & Body Works, but I have to admit The Body Shop makes better body butters. I will have to try some of these! I really have to keep my skin moisturized. It is so dry...especially coming out of winter and getting ready for bathing suit weather! Great article.